We recently sat down to chat with Adam Jacobs, who originated the role of Aladdin on Broadway and on tour, when he ventured into a whole new world at the Disneyland Resort to surprise a Disney Performing Arts show choir group. What is some advice you have for students who need to bring a character like Aladdin to life? A character like Aladdin has a lot of energy so you need to get your cardio up. You also need to make everything look effortless, that’s sort of the trick of Aladdin. He’s running away from guards but he makes it look really easy. So even though you are trying and running around and having a lot of fun, you have to make it look like you’re having fun and not working too hard. I get to sing this great song, “Proud of Your Boy” and it’s a promise he made to his mother that he’s going to do good, stop stealing and become a better person and that really motivates him throughout the entire show. What is one piece of advice for a student wanting to make it in the entertainment industry? If you’re going to make it in musical theatre, you need to sing, dance and act first of all. I would look for conservatory-based training if you’re going to be pursuing it as a career. For me, it took a long time to get to Broadway and you really have to keep going and not give up. Maybe work on your dancing if you’re not as much of a dancer as you are singer or vice versa. Don’t let the negativity of the business get to you, you have to stay positive and be the guy who everyone wants to work with. If you keep a positive attitude, people will want to work with you because reputation is important. Could you tell us a bit about your journey with Aladdin? So, when I auditioned for Aladdin, I was playing Simba in the National Tour of The Lion King in Chicago. I didn’t know they were working on Aladdin at the time so it was a huge surprise for me when they called my agent and told me that they wanted to fly me to New York for the first initial readings to be working on Aladdin, I was over the moon, it was an incredible dream come true. So, I didn’t have to audition initially for those but when they brought on Tony award-winning director, Casey Nicholaw I had to audition for him but once he checked off on me, my fate was sealed in a way. I got to do the out of town tryouts and then Broadway, which doesn’t happen very often where they keep the same cast from the original all the way through so that was a testament to their trust in us and we were very lucky. What would you tell someone going into their first audition? Just be confident, that’s really the number one thing. Be prepared and know what you’re going in for. Just keep it short and sweet and don’t apologize for anything really, just go in there and do your best and that’s all you can hope for. Don’t worry about whether you’re going to be cast or not because so much of it is out of your control, just do your best work every time. So, be confident, work hard and above all, be true to yourself! 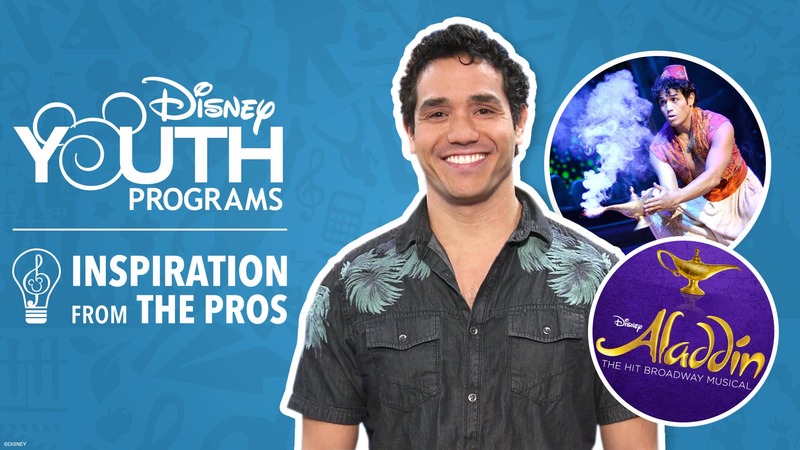 Don’t forget to check out our Disney Performing Arts Workshops where your students can learn from Walt Disney Parks & Resorts Entertainment Cast Members themselves and be sure to sign up for our new e-newsletter for even more inspiration for your classroom. To see Blogs, please reset all filters.